Last August, 2007, the Brooklyn branch of Animal Care and Control contacted the Woodstock Farm Animal Sanctuary about a young goat found wandering in Prospect Park. These calls are surprisingly common – there are over 100 live-kill markets in the NYC area, and with that are frequent unclaimed escapees. Our van picked up the little white goat and transported him to our farm, along with 4 chickens and 2 ducks in search of greener pastures. We named the little guy Albie, after the compassionate philosopher and humanitarian Albert Schweitzer. As soon as he arrived we knew Albie needed special attention. He was underweight, undernourished and infected with the worst case we’d ever seen of Orf, a condition in which lesions cover the mouth and nose, making it painful to eat. 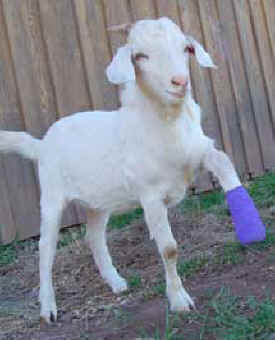 On top of it all, his left leg and hoof were infected and sensitive to the touch. Before escaping, we believe he may have been hogtied – his legs tied tightly together – which is a routine way of transporting young goats intended for meat. The lack of circulation caused a large portion of his hoof to come off, exposing soft tissue that was very painful to walk on. Albie’s mouth sores quickly healed, however, his hoof problem was so severe it was beyond our expertise. We took him to the vet several times and treated him with daily wraps and homeopathic remedies. But after weeks of TLC it was clear his leg was not getting better. More drastic measures were necessary. 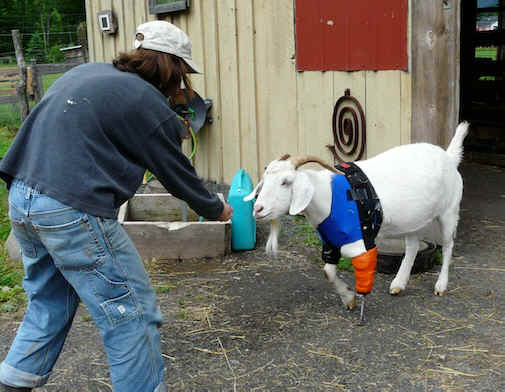 In September, Albie made the long trip to the Large Animal Hospital at Cornell University where he had part of his outer leg and hoof amputated. Last November, book publisher Martin Rowe ran the New York City ING marathon for the first time, raising over $11,000 to help with Albie’s medical bills. 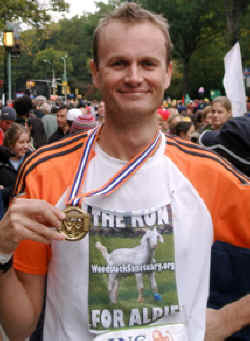 Martin completed the 26.2 miles in just under his goal of four hours. Kind folks from across the country pledged a dollar a mile or more (many tossed in extra if Martin completed the race in less than 4 hours, which he did). Martin Rowe is the co-founder of Lantern Books, publisher of books about animals, the environment, spirituality and vegetarianism. Read Martin’s blog to get a feel of the experience of this five-borough run. Albie’s initial surgery, alas, did not take well. The residual bones were just too fragile to support his weight. Unfortunately, by Christmas, it was clear his leg needed to be more severely amputated in order to prevent bone breakdown. It was a tough decision and hearts were heavy when Albie made anther trip to Cornell in January, where his left leg was amputated just above the knee. The decision to amputate Albie’s leg was a particularly difficult one for sanctuary co-founder and director Jenny Brown, because she is an amputee herself. At the age of 10 Jenny was diagnosed with a fast-moving bone cancer and her right leg had to be amputated just below the knee. This was followed by two years of aggressive chemotherapy. She has worn a prosthetic leg since. Jenny recalls, “Having an illness like that as a child and being so close to death made me look at life more deeply – this included embracing the other species who inhabit the earth with us.” On a deeply personal level, Jenny understands the helplessness that the abandoned, injured and rescued farm animals feel, who arrive at the sanctuary. This is why she founded the Woodstock Farm Animal Sanctuary. “I wanted to be a part of the healing,” she says simply. Unless told specifically, most people don’t even realize Jenny has an artificial leg. It definitely doesn’t slow her down. “It’s a leg not a lobotomy,” she comments. Just like Jenny, Albie’s amputation has hardly slowed him down. In just a few months, he’s gone from a shy, terrified little guy to a goofy, friendly troublemaker. On three legs, Albie roams the farm, greeting people and ransacking the food bins with his goat pals whenever he gets the chance. Albie is now working with a new prosthetist, Patrick Reilly at the University of Pennsylvania. He continues to out-grow his legs but we’re hoping that this new one which he walks in daily will last him for a while. See below of Animal Caretaker Dawnell Kilbourne luring Albie to walk with carrots and alfalfa cubes – two motivating treats! And look at how big he’s grown!